The Geertop 90X Telescope is a high-power refractor telescope designed to offer great performance when you are observing celestial and terrestrial objects. 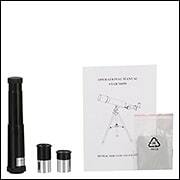 It is a great telescope for entry-level astronomers, children and adults who love watching birds and wildlife. Offered with different magnification eyepieces, the telescope is adaptable, letting you observe near and distant objects while also allowing you to watch different sizes of images. 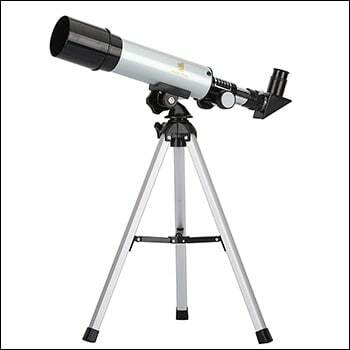 When using this telescope, choose higher magnification for large and easy to locate objects such as the moon and lower magnification for the stars. Lower magnification gives you a wider field of view, letting you focus better. It also makes it easier for you to focus. This text is an in-depth review of the Geertop 90X Telescope. What is Geertop 90X Telescope? 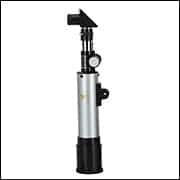 This is a powerful yet easy to operate entry-level telescope. It allows you to explore the night sky, see animals, birds and scenic view terrestrially. It is offered with a mini-tripod that you can place on tabletops and counters. The unit snaps in to place easily and disassembles with ease too. With Altazimuth mount, you can move the telescope vertically and horizontally for great focus. You can adjust the width of view to accommodate different images. Images can be viewed from any angle and still remain crisp and clear. For more clarity, the telescope is offered with a fun green glass lens. The Geertop 90X Telescope is compact and lightweight. It weighs only 5 pounds, allowing you to observe on the go. The unit is accompanied by a variety of accessories so you can get started immediately. 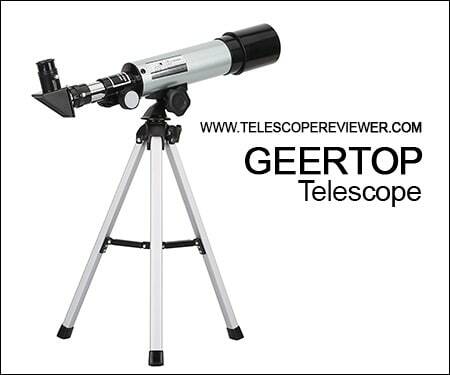 Geertop is one of the popular telescope brands. As such, you can buy it in many outlets and from many online stores. Online, the Geertop 90x Telescope retails at between $30 and $35. This is the same as the price on the manufacturer’s website and a couple of other specialty website. Discounts are often offered. The Geertop 90X Telescope offers a magnification of up to 90X. This is enough to deliver bright and clear images of celestial and terrestrial objects. While you cannot use this unit professionally, as a beginner astronomer, the quality is great. The 1.5x erecting eyepiece increases magnification and also sets the direction of the image. With 360mm focal length and 50mm aperture, this telescope offers great clarity, brightness and contrast. It offers a theoretical resolution of 2800 arc seconds. This means you can see distant objects with distinguishable clarity. The unit comes with alta-zimuth mount that you can move vertically and horizontally for easy focusing. This telescope’s optical glass lens is strong and durable. 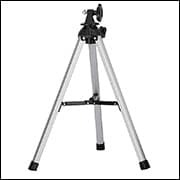 The durability is enhanced further by an aluminum tripod. With a 90-degree Zenith mirror, you will see clear images with the only limit being your imagination. Though not offered with a Finderscope, it is easy to focus. Viewing objects on this telescope is as easy as pointing and viewing. You are offered two more eyepieces besides the 1.5x erecting eyepiece; H6mm and H20mm. You can view celestial objects with this telescope, but the view is not clear for professional use. This means that you will need another unit if what you are interested in is astrophotography or professional lunar and planetary views. Again, it is relatively challenging to focus especially seeing that there is no Finderscope offered with this unit. Users love the sturdiness of the unit. However, for kids, it is still comparatively hard to assemble especially with erecting eyepiece. The Geertop 90X is a high quality telescope and it can withstand falling. However, it needs to be kept far off the edge of a table or counter. You need to ensure that the telescope stays away from dust and dirt. Since this is a kids telescope, you will need to wipe it often. It is offered with a soft cleaning cloth, allowing you to clean the lenses with ease. Other parts of the telescope can be wiped with any other soft cleaning cloth. The lenses should not be cleaned often to avoid scratching as that may interfere with the clarity of this telescope. The three eyepieces allow you flexibility while the zenith mirror gives you a better view. While the offered eyepieces might suffice, you can choose to buy higher magnification lenses for better quality images. 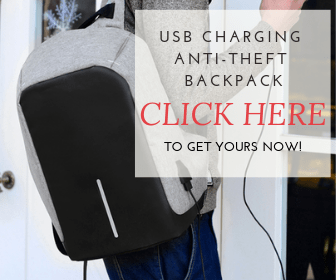 You might also want to buy a travel bag if you need to view on the go. Besides the above accessories, you are offered a user manual and a map of the stars. You are offered a one-year manufacturer’s warranty. You are also offered quality guarantee. Users seem to love the durability of the unit. The warranty covers parts. The Geertop 90X Telescope is all about simplicity and performance. You get to set it up with ease and with good focus, you get clear images. With purchase, the package is accompanied by a number of accessories so you can start star gazing immediately. One unique accessories is the 1.5x erecting eyepiece that ups the magnification of the telescope. The telescope, however, does not offer professional quality images. It is not offered with software and does not connect with a computer. However for entry-level astronomers and kids, it is an awesome telescope. Which features do you like in this telescope? Which features would you want added? Tell us your thoughts below and help someone choose a telescope that meets their needs.